This month, meet Jeanette Davias, Media Relations Coordinator! Jeanette & Scott in rear. 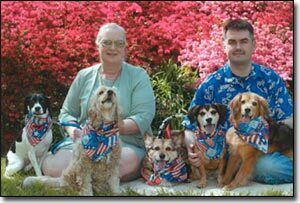 My association with MetroPets (MPs) began in 2000. I ran across the web site, via a link from another site. While wandering around the site, I was amazed to find an "Events Calendar". Since I have (what was termed by a former husband) "a mess 'a dawgs", I was ecstatic to find fun events that I could attend with my "less-than-pure-bred" fur-kids. After a few months, I noticed an item on the site offering a free MPs tee shirt, as a bonus, for joining. Well, never being one to pass up on a "free" offer and (also) feeling slightly guilty for being a regular user of the site, without paying anything, I sent in my membership fee. I was pleasantly surprised to receive the tee shirt; a profile (w/ photo) of my fur-kids, on the MPs' site; and an invitation to their Annual Holiday Party. Before I attended the party, I was under the impression that all MPs offered was a very helpful web site. While, at the party, (which was attended by representatives from every aspect of the pet-lovers' community) I found out about their unique technical Assistance Program. This concept excited me and I contacted MPs to offered my services shortly thereafter. Much as I would like to be a "techie" (I've had a lot of training, but never was able to put much of it to use), my abilities lie in other areas - I am extremely diversified and have excellent organizational skills. I began my volunteer service as the Media Relations Coordinator, contacting the local media to create an awareness of MPs (a position I still hold). I branched out to Community Outreach, representing MPs at various animal-related functions (e.g. : Annual Canine Games), in the Metro area. I also was an active Committee Member for MPs's 2001 "Pets In Pearls"; and created the Rawcliffe Collectables fund-raising campaign (lovely, key chains, gift boxed pewter ornaments, candles, etc). As a side-line, I assist with the MPs Events Calendar. I'm married and my wonderful, understanding husband (Scott James) assists me, with sales and outreach at animal-related functions. 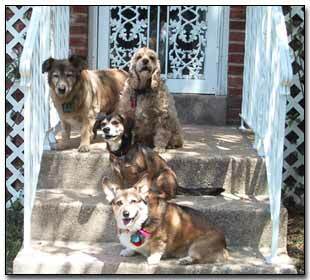 I also have (currently) three fur-kids of indeterminate parentage (Mutts): Duchess; Sadie; & Milo. One of our babies recently Crossed the Rainbow Bridge (Barney). His tribute is also on the MPs site. pet-related information, for the Metro DC area. For me, MPs has been an opportunity to "stretch my abilities". I think that is one of the benefits of a volunteer position ... the ability to do "fun stuff" and learn at the same time. Thank you MetroPets for the opportunity.